How Does the Stop Smoking Nicotine Shot Work? Imagine being able to get a vaccine that would immunize you against nicotine addiction. After receiving a series of shots that encourage your body to build antibodies to nicotine, the vaccine would render the drug non-addictive. While it may seem far-fetched, such a vaccine is currently under development. Originally investigated by researchers at Nabi Biopharmaceuticals under the name of NicVax, Nabi was awarded a $10-million grant in 2009 by the National Institute on Drug Abuse, part of the National Institutes of Health to move forward with the first of two phase III trials. Unfortunately, by July of 2011, they reported disappointing results, saying the first phase III trial had failed, with only 30% of patients seeing any results. In November of the same year, they announced the second phase III trial had also failed, with the vaccine performing no better than a placebo. 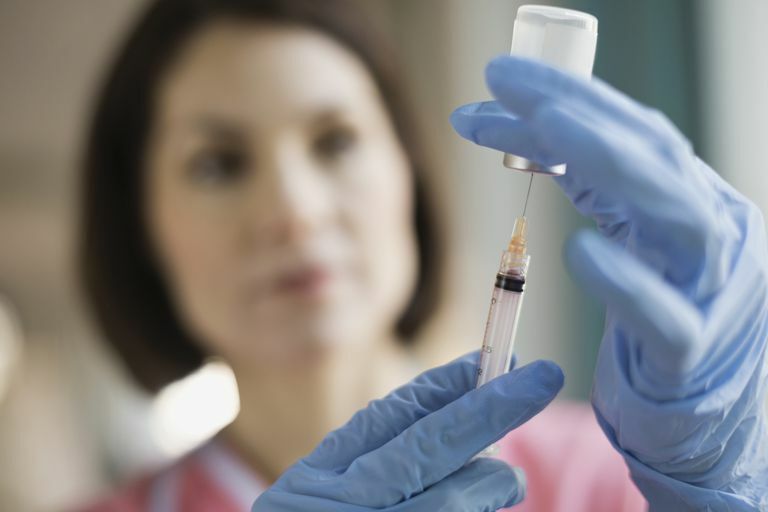 When a person gets a vaccine, the shot contains some of the targeted virus or bacteria in a weakened or dead state. Once introduced to the body, the immune system recognizes and creates antibodies that destroy or disable the invading disease. In this way, the body is prepared against an attack of the live virus or bacteria, should it occur. Nicotine molecules are tiny and move easily through the blood-brain barrier, where they bind to nicotine receptors that activate reward pathways in the brain, increasing the level of dopamine. Dopamine is a neurotransmitter that is responsible for feelings of pleasure, well-being, and dependence. It is this process that is thought to be at the root of physical addiction. The nicotine vaccine trains the body to attack nicotine. It does this by using nicotine haptens in the serum. Haptens are molecules that promote antibody production and attraction when combined with larger protein molecules. When the vaccine enters the bloodstream via a shot in the arm, the body reacts to the haptens by creating antibodies to nicotine. The antibodies then "capture" nicotine molecules by binding with them. Because the antibodies (and attached nicotine molecules) are too large to breach the blood/brain barrier, nicotine is unable to travel on to the brain where it can cause a dopamine release. Without dopamine, smokers don't enjoy smoking, and the link to physical addiction is broken. Researchers at The Scripps Research Institute (TSRI) are working on creating a more robust nicotine vaccine and have seen encouraging indications that they're on the right path. According to Professor of Chemistry at TSRI, Kim Janda, there are two forms of nicotine that are mirror images of each other, "left-handed" and "right-handed" molecules. The nicotine in tobacco is almost entirely made up of the left-handed variety. The NicVax vaccine was made up of a mix of both left and right-handed nicotine haptens and was not an effective vaccine. Researchers at TSRI created three forms of vaccines: a 50/50 mix of the two nicotine types, and pure right and pure left-handed vaccines. In laboratory tests on rats, they discovered that the 50/50 mix was only 60 percent as effective as the pure left-handed vaccine. “This shows that future vaccines should target that left-handed version,” said Jonathan Lockner in a 2015 press release from the institute. Lockner is a research associate in the Janda lab. Research is ongoing but looks promising for the future. The nicotine vaccine, if approved, will be a valuable addition to the variety of quit aids available today. With a human life being lost to tobacco-related disease every 8 seconds somewhere on the planet, smokers need as many choices as possible to help them beat nicotine addiction before it beats them. The Scripps Research Institute. TSRI Scientists Design Nicotine Vaccine That Provokes Robust Immune Response. Nabi Biopharmaceuticals. Nabi Biopharmaceuticals Initiates Pivotal Phase III Study for NicVAX as an Aid to Smoking Cessation and Long-term Abstinence.